“All the business leaders and stakeholders are present in a room. A performance report / MIS is projected. The colorful report contains a whole list of metrics starting from business inputs (like resources deployed, cost of marketing etc.) and the output (like Sales, applications, X-sell, up-sell). While the report might be doing a good job of what is happening, there are some serious problems with this report. Can you spot some of them? The biggest challenge in using this report is that it only answers what happened, it makes no attempt to answer why and how. The performance review ends up being a summary of what happened with no actions or insights about what is working well and what is not. Both these outcomes are far away from the objective of any performance review. So, how do you make sure that your reporting has meaningful metrics which bring out insights and drive actions? The only purpose of keeping absolute numbers should be when you want to compare them against targets or benchmarks, or they are there for some contexts. Otherwise, keeping absolute numbers don’t add value in reporting / analysis. Has Sales per Sales person improved or deteriorated? If it has improved compared to expectation / benchmark, you know that the drop is because of lower number of Sales person deployed. Otherwise, it is driven by something else. Looking at percentage of various cards (products) will give an idea whether this is driven by lower Sales of particular products. Some of the questions in previous point touch on this briefly. Averages can not drive action, you need to analyze and understand things at a segment level. Click here to understand how to create a segmentation. In summary, each segment would differ differently and you can not take action until you report / analyze things at segment level. If you know that the drop in this question is driven only by a channel or product which has not performed well, it is easier to take actions on that basis. Has the drop occurred this month or we are recovering from a drop in past? When did the performance start to worsen? Further, drill-downs can represent the segmentation effectively and pin point the areas of improvement. 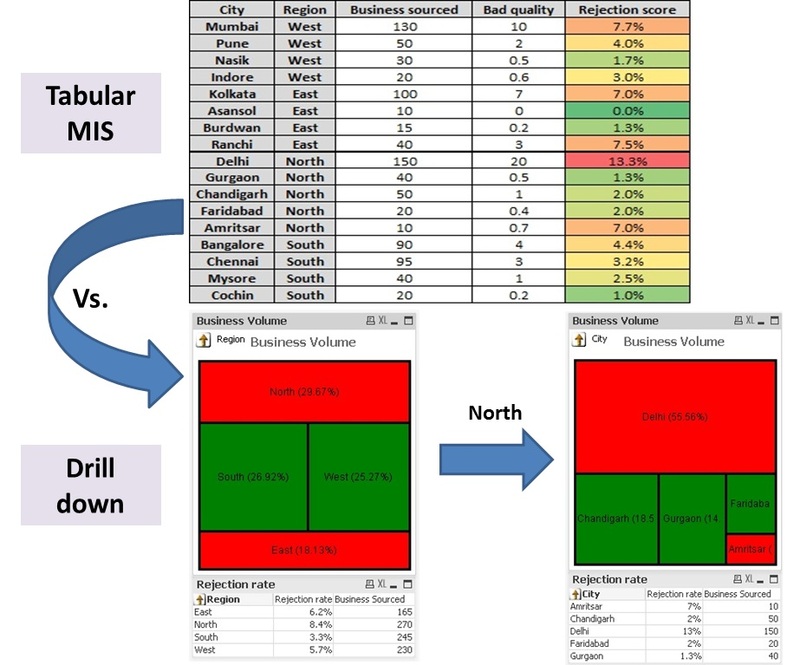 For example, the drill down in image below conveys same information in a better manner. While you can start the reporting at high level, the actions can only happen when relevant metrics at right level are looked at. For example, looking at Approval ratio by Regions / Geographies will help you answer what, but looking at Approval ratio by Sales people can help trigger instant actions. You can provide better training to these Sales people or ask them to re-look at their target segment. Similarly, until you analyze and report Keyword level performance, you can not optimize Search campaigns. What do you think about these rules? Do you have any rules which make your reports more insightful and actionable? Please add them through comments. Good tips. Thank you for posting.